The stage opening with a crashing sound of thunder and lighting with a brilliant band presence. The crowd cheered as they came on. Its been 40 years since ‘Sultans of Swing’ came out, which was a hit all around the world. Together the band sold 125 million records and landed a spot in the rock n roll hall of fame. Mum and I were like kids in a candy store, dancing to all the tunes last night. During the gig, each band member did solo performances. Highlights for me including Chris and Terence solos and especially when they played tracks together and on ‘Sultans of Swing’, just mesmerizing to watch. One of my favourite songs was ‘Walk of Life’, its a happy go lucky song and looking around at the audience they all had smiles on their face. Its was a packed house to! Other highlights for me included ‘Romeo and Juliet’ which I thought Terence performed beautifully. I really can’t believe how much he sounds like Mark Knopfler, he has a softly spoken voice just like Mark. I spoke to people my mum’s age and they are agreed he was perfectly cast to play Mark’s songs. The band had a kind of chemistry which is incredibly rare, they are not just playing a instrument. They feel, breathe and live the music. They know the capability’s of what they are playing and they know how to push themselves to their absolute limit. For me the audience can feel that. The energy between the band was incredible Chris walking up to Tim to play with him on some of the tracks. Tim Walters amazingly talented guitarist who often closed his eyes on tracks and you can know he really believes in what he is doing. Looking at the back catalogue of the band members, very impressive playing with some of rock royalties like Eric Clapton, Elton John, Mick Jagger, Sting, Paul McCartney, Chris De Burgh, Joe Cocker, Ray Charles, Paul Weller, The Who and Robbie Williams just to name a few. These guys will know everything about music and sound and if they don’t it isn’t worth knowing! 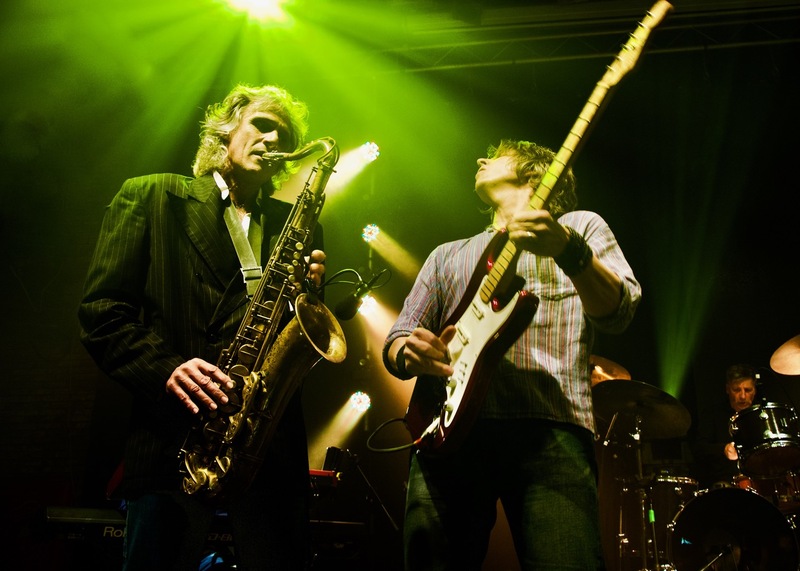 Themselves rock legends, especially Chris White who can play the Saxophone like it was made for him! Speaking to Chris last night I asked him ‘How did you get involved with the Saxophone’ he said ‘I was watching the Television as a young boy with my father and heard the saxophone for the first time and thought wow that sound! That’s what I want to do’! The band didn’t leave the stage for over two and half hours, no break nothing. Just kept the audience rockin out. The last two songs of the night were my favourites ‘Sultans of Swing and Money for Nothing’. Mum grabbed me and pulled me to the front like a groupie dancing and raving out, didn’t care what anyone thought. I loved that! People in my generation care to much about what people think of them. I think this theory also applies to people in the arts, music and any creative field. This ability to ‘Let go’ not a care in the world and dance and create like nobody’s watching. The Dire Straits Experience we saw last night was the same, beautifully talented people playing incredible songs from the last 40 years. Bands like this Dire Straits, The Rolling Stones, The Beatles, Queen, Fleetwood Mac all have quality’s to let go and rock out and play some very difficult songs and make them look easy and the ability to play multiple instruments too. Then they move on to Australia, New Zealand, Germany, Netherlands, France, Czech Republic, Belgium, Austria and finishing back in Germany. Good luck with the tour boys, it was pleasure to you meet you all afterwards. True gentlemen, thank you for an life changing night, rockin’ out! Its a 5 star from us! Go and see these where ever you are in the whole world, there no excuse! They will be playing near you. Thank you to Chuff Media & Music Plus Sport too.